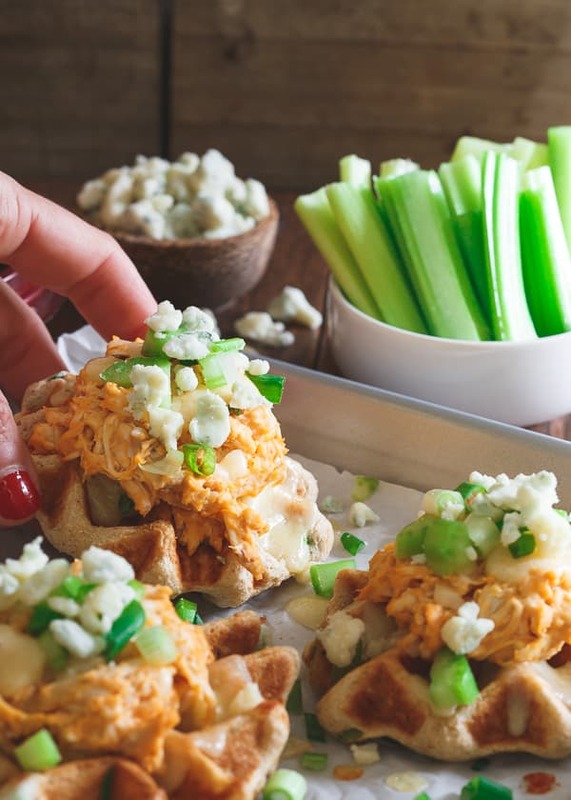 The perfect game day bite, these buffalo hummus chicken waffle bites have sharp melted cheddar, blue cheese crumbles and crunchy chopped celery on top! We got to the resort in Cabo on a Sunday. Of course, the first thing we did was get our pasty white butts into a bathing suit to enjoy the 3 hours of sunshine left in the day at the pool. We arrived at the pool bar just in time for happy hour and what was playing on the big screen behind the 20 something varieties of tequila on the shelf? Of course, I was all “I did NOT just spend 10 hours traveling to arrive in Mexico and watch this crap!” Way to stay positive on the first day of vacation, Gina. But for real, we all know how I detest the sport, the culture surrounding it, how much damn time Americans spend talking about it and even down to the tv commercial break music when it’s on. I just c.a.n.n.o.t. with football. However, I do love its food. What are we, 2 weeks out from superbowl? I have no clue who is potentially playing. I don’t care to know. I probably won’t know until the day of, but I sure as heck have my Superbowl food squared away. 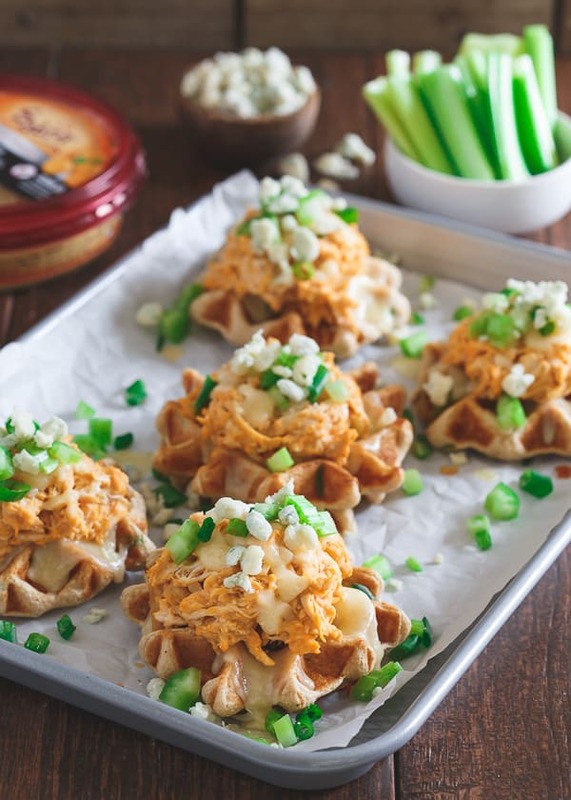 You guys, buffalo hummus chicken waffle bites…they’re like all the goodness of a buffalo chicken wing combined with the carby deliciousness of waffles and gooey melted cheddar cheese. To keep things slightly healthier on the chicken side, I used Sabra classic hummus to make it chicken salad-like. Creamy buffalo flavor, in a healthier package…#winning. I’d like to be able to say my football loving husband gave these two thumbs up or something cheesy like that but truth is, he’s even more clueless and uninterested than me when it comes to any traditional American sport (I knew I married him for a good reason). Unless there are motors or some sort of extreme element involved, Ulysses has no care. Despite that though, he downed these. So, if football ain’t your thang either, no worries, you can still enjoy these waffle bites too. 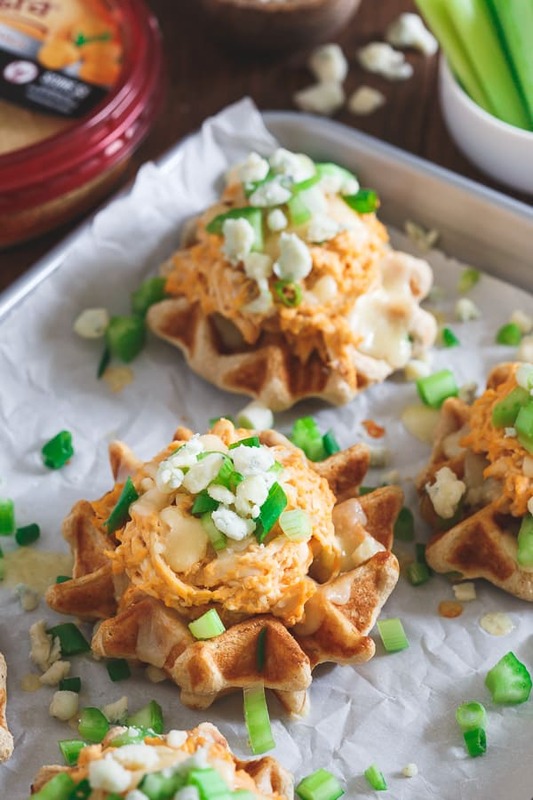 Love this Buffalo Hummus Chicken Waffle Bites? Preheat and grease your waffle iron. Add green onions, salt and pepper to your waffle batter and mix together. Add about 1/3 the amount of normal batter you would to your waffle iron for a bite-sized waffle and cook according to your waffle iron's directions. Repeat until all waffles are made and set aside. The chicken amount makes enough for about 6 waffles. If you're making more waffles than that, you'll have to increase the other ingredient amounts as well. Combine chicken, hummus and buffalo sauce in a medium bowl and stir until thoroughly combined. Slice 2 ounces of the cheddar thinly and place on top of the waffle bites. Arrange the waffles on a baking sheet lined with parchment paper and melt in the oven for about 3 minutes. Remove from oven, spoon chicken mixture evenly on top of each waffle and divide the remaining 1 ounce of cheddar cheese on top (sliced or crumbled is fine). Return to the oven for another 3 minutes. 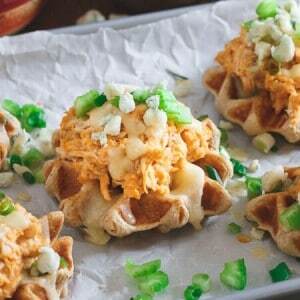 Remove from oven, add chopped celery and crumbled blue cheese to each waffle and serve warm. Waffle mix - use your favorite mix or make a batch from scratch. I used Kodiak Cakes (highly recommend and LOVE!) which you just add water to and eye-balled the amount of mix per waffle bite. You want these waffles to be about 1/3 the size of regular ones so just use the appropriate amount of whatever batter you choose. This post is sponsored by one of my favorite brands to eat and work with, Sabra! These are too cute and sound delicious!! These are SO stinkin’ creative; I love it! I would totally scarf a billion of these on game day! It is a little ridiculous how football takes over EVERYTHING this time of year. I can’t lie, I am excited the Broncos made it, but let’s be real the food and booze are really what the Super Bowl is all about. 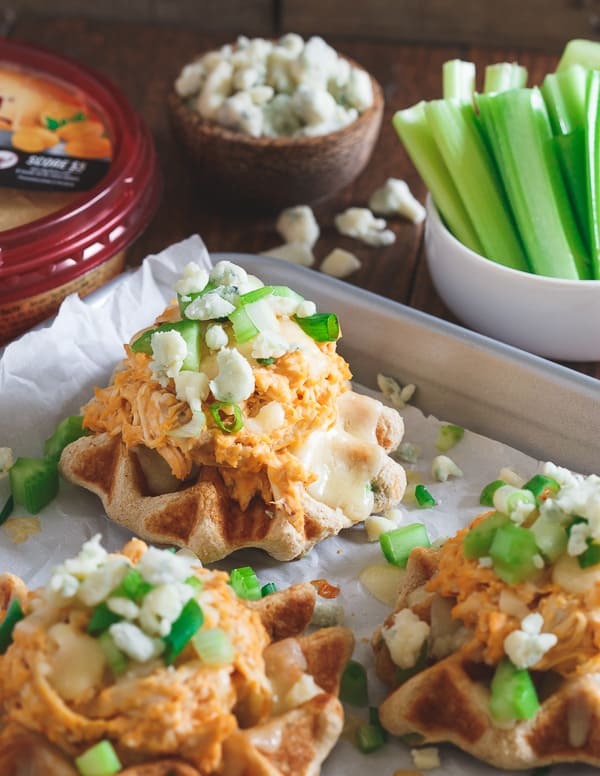 These buffalo hummus chicken waffle bites are brilliant! I can’t wait to make them! Girl did you hear Sabra just came out with a Buffalo hummus?? Its so damn good. Also i want these right now! Nope, not a fan. Like, at all. I come for the food and that is it. Love these bites! I used to hate football, but like golf, it’s grown on me. But onlike golf, football is associated with good food. Truth be told that’s probably why I like it. It’s a way to be social and an excuse to eat. Gina, these are one of the best appetizers I have ever seen! I adore them! Your husband is like mine. Couldn’t care about sports, and I love it! Just like these bites here. So let’s skip all this football noneness and just go for the food. Sound like a plan? I love these and the recipe seems simple enough to make! OMG! I am drooling over this . How much fun is Game-Day food! !